Gary Steszewski was named the P&BA 2006 Man of the Year. The announcement was made at the General Membership Meeting on March 7th. Gary Steszewski has been a member of the P&BA since 1997. He immediately became pro-active and has since made numerous contributions to our Association. Gary served on the Board of Directors for 6 years. An interesting note – he was not present at the event where he was elected to the Board in1998. He and his wife, Mary Ann, just happened to be in Chita, Russia, in the middle of winter, adopting their two children, Joseph and Katherine. 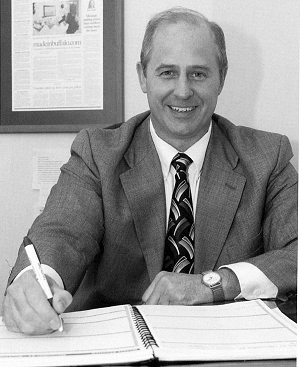 Gary served as President in 2001 and 2002 and held other Board offices during his tenure. While serving as President, a set of standards for full disclosure of financial and tax reporting, and financial responsibility were established. The P&BA website came into existence during his tenure, and membership increased by 29 percent, from 157 to 202 members. Our Man of the Year served on numerous Association committees and chaired many of our successful events. The most memorable event was Chairman of the P&BA’s 100th Anniversary black tie affair that was attended by over 300 members and guests. In promoting the growth of Polonia and the Community, Gary is an Executive Board Member and Treasurer of the Solidarity Task Force, Political Action Committee. Gary is a self made entrepreneur. He began his career in 1964, at eight years of age, delivering the Buffalo Evening News. He worked his way up the ranks to Division Manager for the News in 1996. A career change as a financial advisor brought him to AG Edwards followed by the MONY Group. In 1999 he co-founded CityMade, Inc. He started madeinbuffalo.com in 2000 and madeinrochester.com in 2003, making products made in Buffalo and made in Rochester available to those living outside the area. CityMade continues to project solid growth.